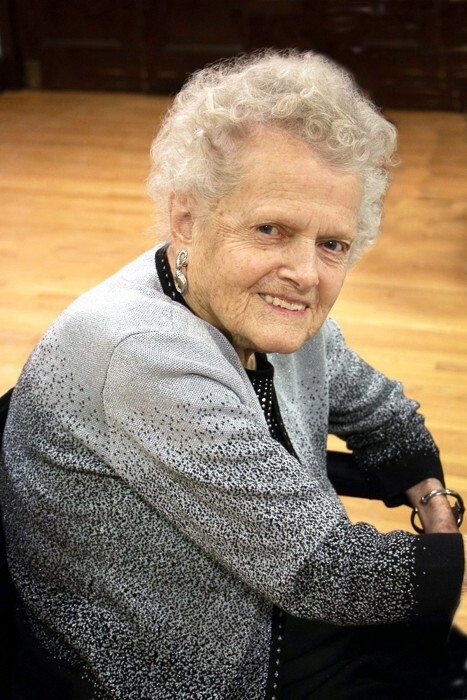 Greenfield, MA – Esther Davenport LaPierre, formerly of Shelburne Falls passed away peacefully on Thursday at the age of 101, leaving a legacy of a full life well lived. Esther was born to Louis A. and Ellen A. (Warner) Davenport in their home on Davenport Road, Rowe, MA in December of 1917. She enjoyed a childhood filled with love on her family farm. She enjoyed riding atop her workhorse Teddy as her father worked the land with horse drawn implements. She would ride Teddy to the lower fields and knit while watching over the grazing cattle of their dairy herd. Esther especially enjoyed maple sugaring season, done at the sugarbush on the land of a second farm they owned in Charlemont. Their farm on Davenport Road was the first to get electricity in Rowe, a proud achievement for the family. Esther graduated through several grades at the one room schoolhouse on Davenport Road. She went rapidly through more grades at the school in Charlemont, hitching a ride with her father or farmhand driving the horse team as they delivered milk into town. She took piano lessons in town as well and started a life long love of music. After elementary school, her folks sent her to board in Greenfield while she attended Greenfield High School, graduating in 1934 at the age of sixteen. In an unusual move for that time period, her parents then sent her to Bliss Business School in North Adams, MA where she learned her bookkeeping skills that would also serve her well later in life. Esther took her love of music on to take guitar lessons from Francis LaPierre who owned a music studio in Greenfield. Some how her lesson time ended up the last of the day for Francis, she apparently needed a ride home in his coupe and they were wed in 1936. Francis and Esther played together live on the first day of broadcast for WHAI and regularly on radio stations from Springfield, MA to Springfield, VT as their group The Banjo Jubileers. Esther taught piano to hundreds and hundreds of students over the decades from their home studio in Shelburne Falls. She played piano with LaPierre’s Orchestra for 17 years each week at the Eagles in Shelburne Falls and for countless weddings, square dances and special events over the years. Esther was a talented professional musician, a faithful parishioner of St. Joseph’s in Shelburne Falls, but nothing was more important to her than being a homemaker and raising her family. Esther was predeceased by husband Francis in 1983, she remained in the family home before moving to Greenfield, residing at the Arbors and finally at Charlene Manor. Her brother Richard Davenport and sister Edna (Garofalo) both lived into their late 90’s. Esther’s eldest son Gary LaPierre passed away earlier this month at age 76. She leaves; daughter Carol and her husband Bob Brewer of Vero Beach, FL / daughter Sandra Hobart of St. Charles, MO / son Richard and wife Joan of Shelburne, MA / son Robert and wife Pamela of Greenfield. Esther has 47 descendants including 12 grandchildren, 18 great grandchildren and 12 great, great grandchildren.